LONDON -- For the 14th consecutive season, Arsene Wenger won't be picking up the Premier League trophy. It's not been possible to write off Arsenal's prospects hopes so early under Wenger. And even Wenger's title-winning "Invincibles" feat could be usurped as Manchester City outshines Arsenal's unbeaten class of 2003-04 with 20 wins and two draws after 22 rounds of 38. Arsenal isn't even in City's slipstream but floating far from the leaders, sitting adrift by 23 points and actually closer to the relegation zone by four points. No wonder Wenger was in full deflection mode after dropping yet more points in a 2-2 draw with Chelsea on Wednesday. Rather than concentrating post-match comments on acclaiming his team's resolve -- Hector Bellerin grabbed an equalizer in the second minute of stoppage time -- Wenger unleashed on referees, the media and the packed festive schedule all rivals have had to contend with. What so incensed Wenger was Chelsea being awarded a penalty for Bellerin's challenge on Eden Hazard, just after a resurgent Jack Wilshere put Arsenal in front. Bellerin's later equalizer wiped out Marcos Alonso's strike. "I knew before the game that the last 20 minutes could be difficult for us because we have a big disadvantage with the schedule," Wenger said, referencing having to play on Sunday while Chelsea enjoyed a further day's rest. "And we got again a farcical decision on the penalty but ... we knew that (would happen) as well before, so we had to deal that." Referees -- such as Anthony Taylor on Wednesday -- are prevented by the league from defending themselves in public after games. And, according to Arsenal's manager of more than 21 years, officials get a soft ride in the media. "Referees get away with you, with the English press, always, no matter what they do," Wenger said, seemingly oblivious to the spate of articles and television segments dissecting officiating mistakes. Wenger was vexed by north London rival Tottenham winning 2-0 at Swansea the previous night to go a point ahead of Arsenal with a game in hand. "You have watched the game which included favourable refereeing decisions for Tottenham?" Wenger said. "You couldn't read a line about it today (in the newspapers). "So nothing will change and we have to deal with that and live with that." The 68-year-old Frenchman is already facing a punishment from the Football Association for his comments and conduct around the referee's changing room following Sunday's 1-1 draw at West Bromwich. Referee Mike Dean was Wenger's target at West Brom for awarding the hosts a soft penalty for a handball by Arsenal defender Calum Chambers. Wenger is contesting the FA charge. "I am 35 years in football," he said. "I know what I say after a game and I stand up for what I said, no problem." Wenger's main problem is a potential second season out of the Champions League unless sixth-place Arsenal can force its way back into the top four or win the Europa League. 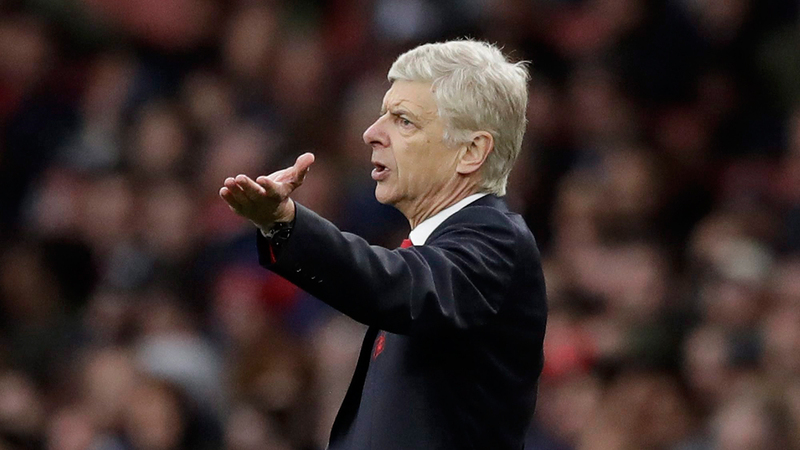 "It's very frustrating," Wenger said, with Arsenal five points behind Liverpool. "We have to look at ourselves as well." And many fans will be looking at the manager who restored the club's greatness, maybe only to stay too long in the Arsenal dugout. Wenger has another complete season remaining on his deal. The odds aren't stacked on him ending that with a fourth Premier League title, ether, especially as he faces losing Mesut Ozil and Alexis Sanchez on free transfers at the end of this campaign. Wenger will be running out of targets to blame.